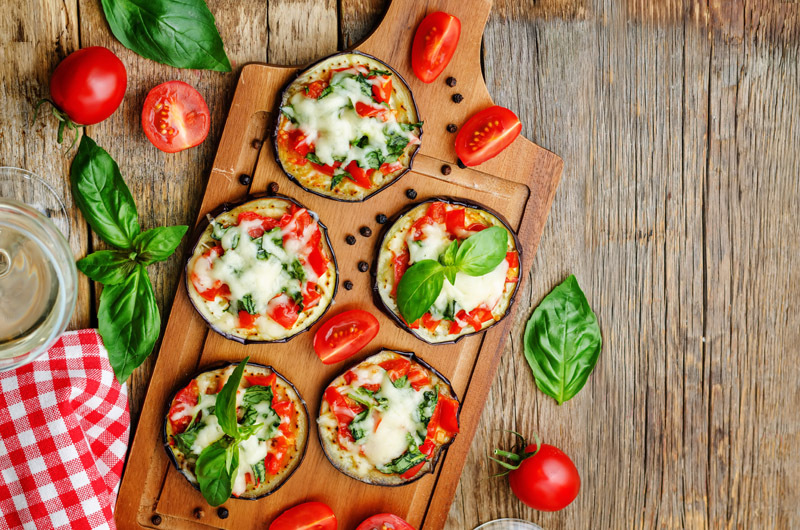 Eggplant Pizza Bites is a delicious, easy-to-make recipe that has fast become one of our favorites. We're hoping you like it too! Preheat the oven to 400° F. Lightly grease a baking sheet with vegetable oil. Cut the eggplant into 1/2-inch thick rounds and place them on the baking sheet in a single layer. Add a tablespoon or so of marinara to the top of each piece of eggplant. In a small bowl, stir together the freshly sliced tomato, garlic, and a pinch of salt (optional). Top with basil and then add the cheese. Pop them into the oven for 10 to 12 minutes or until the cheese has melted. Remove from the oven; garnish with more fresh basil and vegan parmesan if desired and enjoy!